For a truly unforgettable experience of the exotic Egypt, a stay at the grand Cairo Marriott Hotel & Omar Khayyam Casino is a must. Located in the vibrant Zamalek district of Cairo, the hotel features 1,060 luxurious, beautifully decorated rooms offering panoramic views of the city and its lifeline, the Nile river. Those who are drawn towards ancient monuments will be delighted with the location as well. Just a 45-minute drive will take you straight to the Pyramids of Giza. The hotel has an array of speciality restaurants and bars, serving everything from fresh sushi to delightful middle-eastern fare. 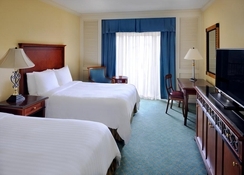 High-speed internet access, plush pillow-top mattress beds, and LED TVs make your stay a comfortable one. Fitness enthusiasts can head to the health club, take a dip in the swimming pool or enjoy a relaxing sauna. The Omar Khayyam Casino offers an unparalleled gaming experience. Cairo Marriott Hotel & Omar Khayyam Casino enjoys a fabulous location at the heart of the city of Cairo. Situated in the affluent Zamalek district, the hotel is surrounded by upscale shops restaurants and some the iconic landmarks of the city, such as the Cairo Opera House. The nearest airport is the Cairo International Airport, which is located at a distance of 23.2 km. A total of 270 modern and cheery rooms spread across two floors are up for the guests at this all-inclusive hotel. 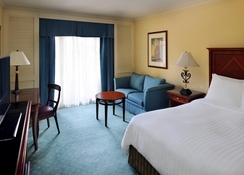 The comfortable, well-designed guest rooms are furnished with modern facilities. There are two sets of rooms, all of which come fitted with the same amenities except for the difference in room sizes. Bone Club Sunset Hotel & Spa consists of 197 Standard Rooms that can sleep up to four people, and each come with a balcony. 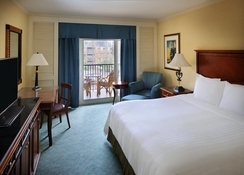 The Family Rooms are more spacious, and sport two separate bedrooms along with balcony. They are suitable for larger families of up to five members. The hotel also offers specially designed rooms suitable for travellers with physical disabilities. Basic room amenities include air conditioning, telephone, TV with satellite connection, housekeeping, mini bar, private bathroom with shower, hairdryer and toiletries. Each of the 1,060 rooms and suites of the hotel is exquisitely decorated with plush bedding, expensive wooden furniture and an array of services and amenities. Stunning views of the city outside welcome you as you wake up every morning, while luxurious bathrooms with complimentary bath products ensure that you have a great bathing experience. Superfast Wi-Fi network helps you to stay connected while you are vacationing. Some of the rooms come with kitchenettes, thereby allowing you the flexibility and convenience of cooking your own meals. Booking the Royal Suite will give you free access to the executive lounge, butler service and a range of newspapers delivered to your room upon request. 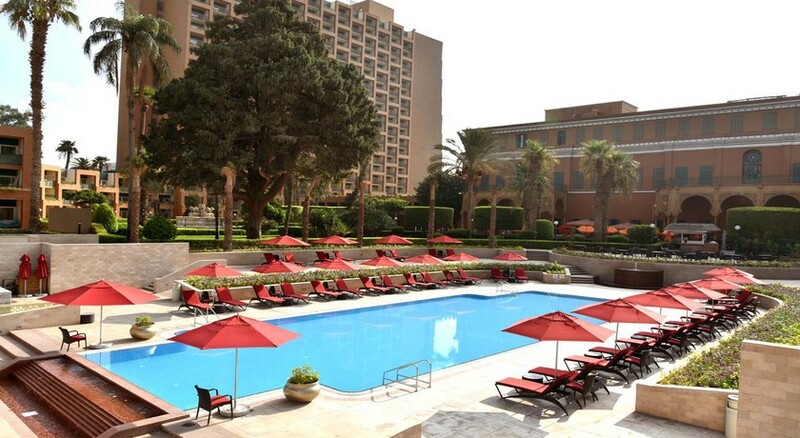 Staying at the Cairo Marriott is definitely an experience to be cherished. From juicy steaks grilled to perfection to hearty Italian pastas, Cairo Marriott Hotel leaves no stone unturned when it comes to tingling your taste buds. Enjoy prime cuts of American beef at JW Steakhouse or have a cup of flavourful Darjeeling tea at Saraya Gallery. Savour delicious Middle Eastern fare along with live music at Somaa Basha, or dig into classic American country dishes at Roy’s Country Kitchen. The Garden Promenade Café hosts a luxurious BBQ brunch every Friday, while the hotel’s bakery is renowned for its decadent pastries, freshly baked croissants and breads. The choices for drinks and cocktail are also endless. From Billiard Bar’s casual elegance to Empress Show Lounge’s grand evening shows, Cairo Marriott makes sure that you let your hair down after the day’s hard work. State-of-the-art fitness centre, heated outdoor pools and saunas amp up the luxury quotient of the hotel. The city outside is a veritable treasure trove of museums, historical monuments and old buildings, reflecting the rich colonial heritage of Egypt. 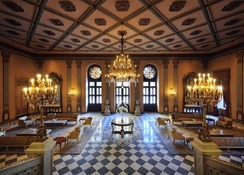 Enjoy easy access to the Egyptian Museum and Cairo Museum, and attend a show at the Cairo Opera House. 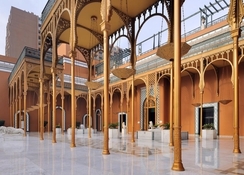 Tour the Museum of Islamic Arts and Zamalek Gallery and be amazed at the artistic heritage of this wonderful land. Take a day off from your busy schedule and see the grandeur of the Pyramids at Giza. If you’re looking for entertainment, head to the Omar Khayyam Casino that offers everything from 80 slot machines to 15 gaming tables. The 35,500 square feet of function space of the hotel is perfect for a corporate meeting or a social event.